Congratulations on your Design Talent Award from A&W Magazine! I would love to hear more about REMIND ME, your winning project. What is it, how did you come up with the idea for it, and what was your goal in creating it? Thank you! 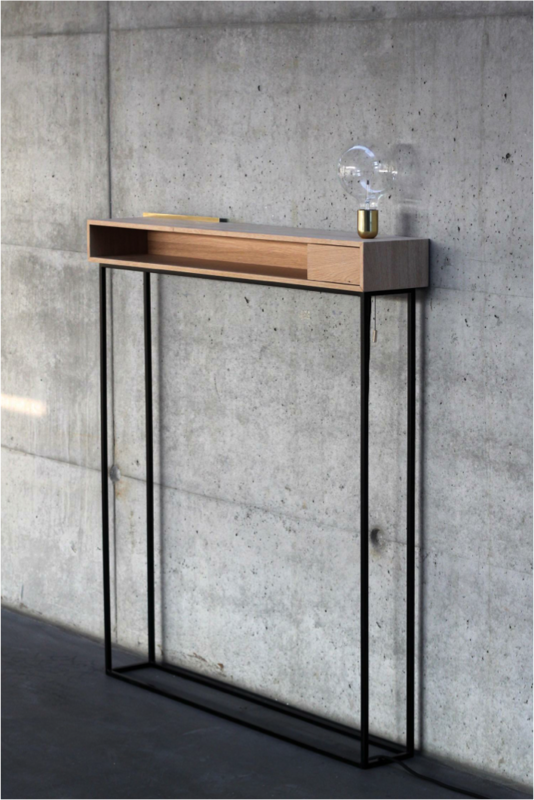 REMIND ME is a sideboard/occasional table that I designed with my fellow Thalea Schmalenberg. During our collaboration, we thought a lot about the concept of oblivion or lack of awareness of everyday things. We tend to overlook the mundane because we encounter it every day. How helpful would a piece of furniture be that helps us to be mindful of the small, but important things? The sideboard mitigates the repetitive drone of the mundane and urges us to consider the what we may have absentmindedly forgotten before we leave our dwelling. The bulb connects to a motion sensor and acts as a symbol for intelligence, ideas, and innovation. As an integrated piece of the table, it serves as a light source, but also as a concrete representation and conditioning force for what we wish to remember. What was your initial reaction when you learned that you received the award? Receiving the A&W New Talent Award is a big honor. I was very excited about the award, and I feel honored that they have chosen our piece out of 700 projects. It’s very affirming to receive this kind of honor. As a designer, you want people to understand and delight in your work. So, it’s encouraging for me as I continue to develop concepts and new pieces. Please share any reflections you have on the award and your project – how it has impacted or changed your career as a designer, what you learned from the process, etc. Probably the most valuable lesson REMIND ME has taught me, is that creating an object as a one-off is nothing compared to the process involved in bringing it to market. I have learned that I am really interested in small-batch production, where I can have more control over fine materials and quality, which is often sacrificed in mass production. As a graduate student in Design Studies, finding the time to dedicate to solo-production is challenging. As an alternative, we are searching for local artisans and manufacturers that could produce REMIND ME in a way that is more aligned with our design ethos. One benefit to winning is that awards like the A&W New Talent offer a valuable platform to get in touch with producers and other designers. I’m excited to see how this project will develop. 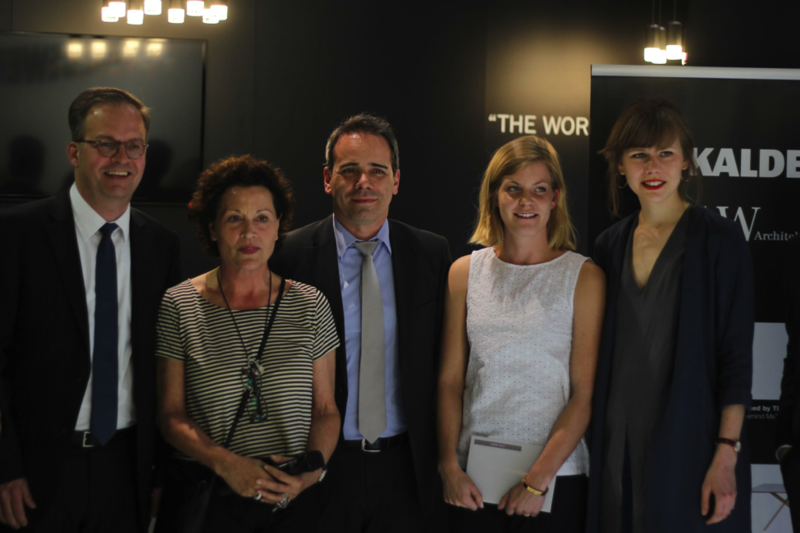 What did you learn from attending the Furniture Fair in Milan this year? How have you been able to apply that to your work, either in your theoretical studies at Parsons or in your design? The furniture fair in Milan is such a bounteous showcase of many of the best thinkers and makers in contemporary design. It is such a great place to network and a tremendous resource for theoretical research and inspiration. It is always so inspiring to speak with other designers, see their work, and watch as patterns emerge within common themes. It is important to me to be able to apply my theoretical knowledge to existing projects. I enjoy reading about concepts and seeing them realized. 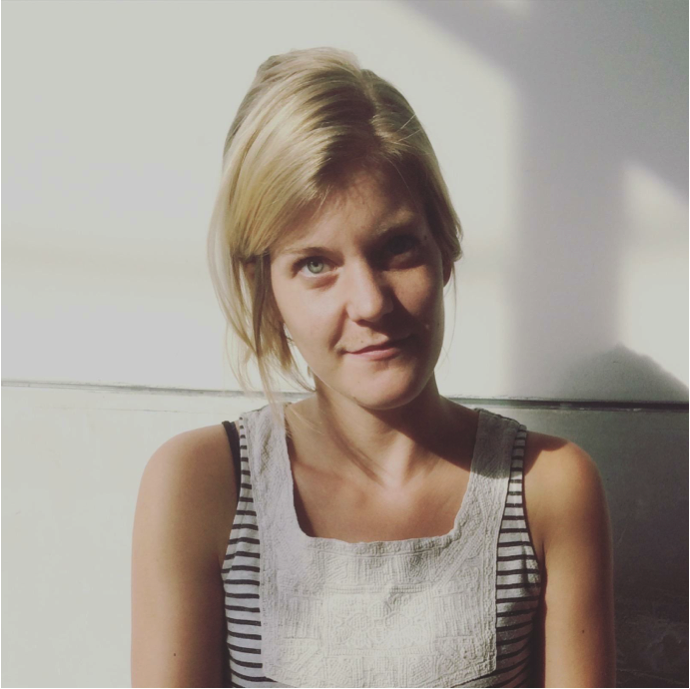 Why did you choose to attend the MA Design Studies program after you finished your undergraduate studies in product design? I have long been interested in how ideas arise and how they evolve into manifestos and movements. Design influences every aspect of our lives, and I knew early on that design and scholarship work in tandem. As an undergraduate, most of my decision making was intuitive. The reference to theory and implementation of sociology, ethnography and social research was something I longed for but was missing from the foundational curriculum. The process involved in researching, writing and describing one’s work is, unfortunately, not part a foundational education. I am convinced that it is incredibly important and valuable for a designer to be able to craft a narrative about their work and intelligently speak to the context and process involved, which was the driving force behind my choice to be a part of MA Design Studies. How have you merged the theory that you’ve encountered in the MA Design Studies program with your work in product design? My writing and research skill have significantly improved. What I still struggle with is original theoretical input. That’s when I have to remind myself that I am not a design theorist, and my intent is not to be a writer as some of my very brilliant colleagues in the DS MA program. But, that’s where valuable collaboration can take place, and I enjoy that process very much. In your opinion, what is the importance or value of approaching design practice from a theoretical and historical background? Design is not a solitary act. Design is for people. A designer must, therefore, understand the history and knowledge of the profession, just as it is important to understand our history as a species. We cannot move forward and face the challenges that await us, without a firm understanding of where we’ve been and what our successes and failures have taught us. What projects are you working on currently, either inside or outside of the Parsons classroom, that you would like to share? This semester, I was able to combine theoretical courses with more practical oriented ones. I took part at the Provocative Products course, which was taught by Otto von Busch. The course paired design practice with criticism and theory-based explorations, where the aim was to merge thinking and making into one cohesive, integrated and provocative activity. Students from the Industrial Design MFA and Design Studies MA joined the class. Ari Elefterin from the Industrial Design program and I worked on a project called Melt. Melt is a pairing of flatware constructed entirely out of ice. 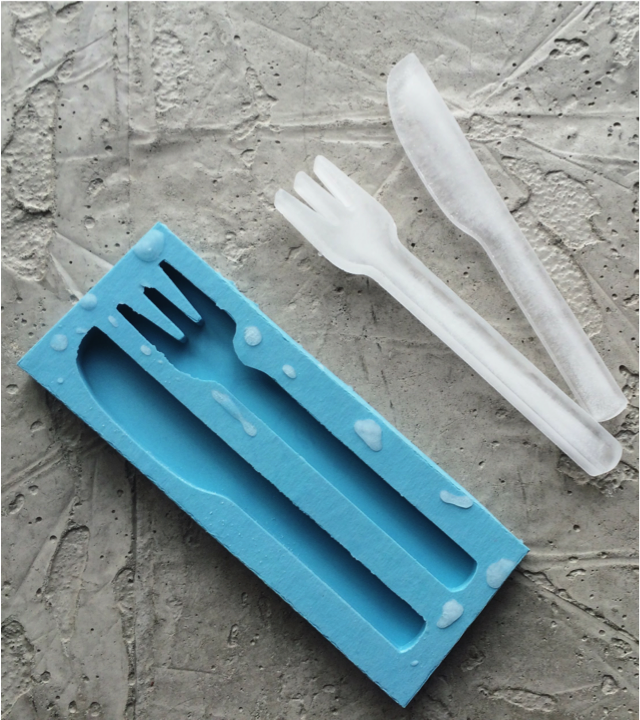 A set of molds allows for a fork and knife to be cast in a conventional freezer and used as the eating tools for a meal. Participants are fed foods that would have been historically difficult to preserve or radically different in preparation without the advent of refrigeration. Participants are not given any alternate utensils throughout the duration of the project, which draws from the paradoxical reality that the ice caps are melting, and that ice production and refrigeration are some of the biggest perpetrators. This project is part of the Parsons Festival exhibition Impact! located at South Street Seaport. Many of the projects showcased are great examples of how research can guide us to great projects.